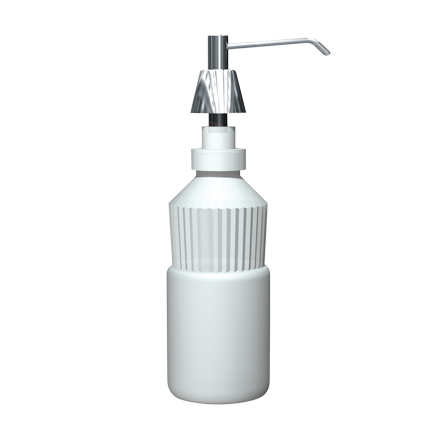 Lavatory Basin Liquid Soap Dispenser 6” Spout, 4” Shank – 20 oz. Corrosion-resistant valve with stainless steel spout and chrome plated brass escutcheon plate. Dispenses 20 oz. (.06 liter) of liquid and lotion soaps, synthetic detergents and antibacterial soaps containing PCMX and/or Triclosan. Soap container is translucent, shatter-resistant polyethylene. Vandal-resistant spout shall rotate 360° without damage to unit. Capacity 20 oz. (.06 L). Spout projection 6″ (152 mm).